Eric Wilkins tells the story of having the best jerk chicken of his life from a street vendor near Gitmo (Guantanamo Bay Naval Base) while he was there with the U.S. Navy. Wilkins searched the Charlotte area to find a sauce that achieved that extraordinary flavor so he could duplicate this meal on his grill at home. Recently, he found paradise in a bottle at a local shop. Grace Jerk BBQ Sauce, by Grace Foods of Kingston, Jamaica, is a well-crafted mix of ingredients, including tomato paste; onions, garlic, shallots and peppers; Dijon mustard; vinegar and lime juice; and thyme, allspice, mustard seeds, and ginger. These blend to create that sweet, spicy and hot flavor profile pervasive in Jamaican jerk. 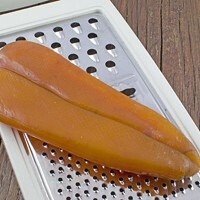 The word "jerk" is thought to have come from the Spanish word charqui, which is from the Quechua word ch'arki (meaning dried meat, as in jerky). In the Andes, where Quechuan was spoken, the common method to preserve meat, such as llama, was to dry and salt it. Jerk barbecue sauce is not the same as a jerk seasoning paste, which is a blend of Scotch Bonnet Peppers, scallions, allspice, nutmeg and thyme. But using either wet or dry jerk seasonings is the traditional method way to flavor pork, chicken, beef, goat and seafood on Jamaica. Wilkins found his sauce at Island Groceries, 5861 Albemarle Road (704-532-0322). 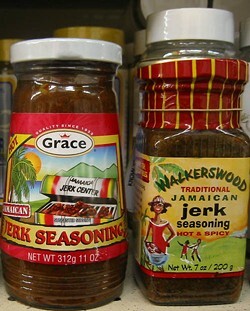 Both Grace Jerk BBQ Sauce ($5.09) as well as the popular Walkerswood Dry Jerk Seasoning in mild and spicy ($4.95) are available. Sunburned armpits, Francophones, whaling and snorkeling at a place called Moonhole.